In April 2006, one year after the assassination of Rafiq Hariri, and with the power of Hezbollah on the ascent, Teresa visits Beirut to research how the Lebanese, and in particular Lebanese women, live with their memories of Lebanon’s civil war. 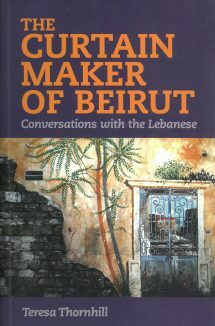 In conversations with housewives, intellectuals, artists and hotel cleaners, she attempts to understand how Lebanese from the various sects which make up this small country – Druze, Christian, Shi’a and Sunni – live with their memories of the Lebanese war; how they feel about each other; and how they see the Palestinian refugees who live among them. The Palestinian Israeli conflict forms the backdrop to this portrait of a tense country, where sectarianism is never far from the surface. Many ordinary Beirutis make comments which anticipate the Israel-Lebanon war which was to erupt weeks later, in July 2006. Teresa began her travels in Lebanon in 1999 and returned with her partner and young son in 2002 and 2003. She made her final visit, alone, in 2006. Themes of motherhood and separation are woven delicately into what is, in essence, a portrait of a country in the throes of unending conflict.